If we can’t get the odor out, then you don’t have to get your wallet out. We at Gallagher’s put our money where our mouth is. We have the most advanced technology known to man, and if we can’t get the odor out, then you don’t have to pay one cent. In each case, the carpet must be cleaned at our advertised price. These prices are in addition to regular cleaning. 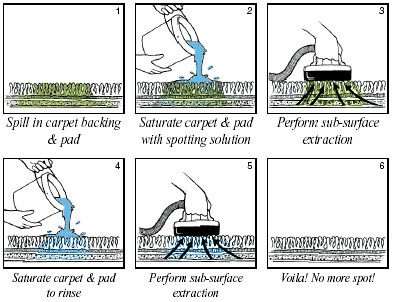 We will apply a deodorizer to the surface of the carpet and work it into the carpet with a grooming rake or brush. We will apply a deodorizer and a sanitizer to the surface of the carpet and work it into the carpet with a grooming rake or brush. We will saturate (with a multi-oxygenated cleaning agent ) the carpet, padding and sub floor. This will dissimulate the urine compounds to then be extracted out. We will pull up carpet in the corners and treat front and back. Apply an odor sealer to the padding and sub-floor and reinstall carpet in contaminated areas only. We will pull up carpet in the corners and treat front and back. Install new padding, treat sub-floor and reinstall carpet in contaminated areas only. We will pull up carpet, pull out contaminated padding, treat and seal floor, * replace with new padding, treat carpet backing, re-install carpet and deodorize carpet. * ( An additional $4.00 per yard will be charged for padding installation. The padding it self is free). I have read the description of each plan and have decided to choose plan ____. I understand that the only plans that are guaranteed are plan E and F. It is further agreed that under the provisions of this guarantee that the company’s extent of liability is limited to the cost of services provided by the company. The company will accept no liability for conditions existing prior to cleaning. In the event that the carpet is so severely damaged, by previous existing conditions, that the carpet can not be treated, it is agreed that I the customer shall bear the additional cost of carpet repair or replacement. I have read and understand the above statement and agree to these services provided under these conditions. More do-it-yourself videos coming soon. Soon I will show you how to do it yourself and with products already found in most people's homes. If we can’t get the odor out, then you don’t have to get your wallet out. We at Gallagher’s put our money where our mouth is. We have the most advanced technology known to man and if we can’t get the odor out then you don’t have to pay one cent. Soiled carpet and padding from pet. Tip #1: Put the hot water in the bucket before the power crystals are added. Tip #2: When placing powered crystals in the hot water, do it right over the area you want to treat. Many times the multi-oxygenated cleaning agents expand and will flow over the bucket. Tip #3: Be careful not to burn yourself when pouring the solution. Tip #4: Never do this procedure over hardwood floors. There is a possibility of the floor swelling or buckling. Mix with a wooden stick or broom handle until crystals are completely dissolved. (It is a good idea to walk on the wet carpet with rubber boots on to disengage the urine from the carpet and padding). Pretend you are in a winepress stomping the juice out of grapes. Extract solution with sub–surface liquid extracting tool. You are all done. In severe cases, you may need to repeat the above steps. To get some professional strength multi-oxygenated urine remover like we use, just call me at 916-300-9010 and I will get some for you. It is $155.00, plus shipping costs. They only sell this stuff in one size. It will make 50 to 100 gallons. Remember that this is made for us, odor damage specialists who do this for a living. Sub–surface liquid extracting tool sells for about $120.00 on the internet. It is called the water claw. Don’t even try this without one of these extracting tools. It will not work and you can ruin the carpet and the floor without this special tool. I have invented a sub–surface liquid extracting tool very similar to the water claw. I call it the water paw. Whoever buys the urine remover this month, I will give one of my prototypes for free. With one condition: I need you call me and let me know how I can improve it. Or, you can find the similar water claw product on the Internet for about $120.00. Call 916-300-9010 for a free water paw sub–surface liquid extracting tool today. First-come, first-served. PS. The sub–surface liquid extracting tool also works well on spills and stains that come up from beneath. PPS. Yes, we do take VISA and MasterCard.